Spider-Man’s new “stealth suit” for Spider-Man: Far From Home has been revealed up-close at Brazil’s Comic Con Experience. 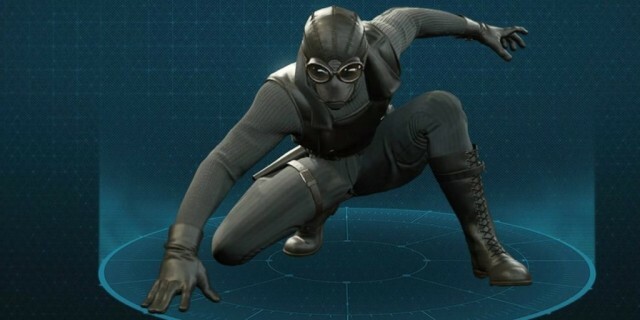 It takes heavy influence from the Spider-Man Noir design (pictured above), but what might be the most interesting thing about the design is what’s not on it. The costume will be one of at least two that Spider-Man wears over the course of the film, and you can get a look at the first (which was officially revealed by Tom Holland when principal photography wrapped) here. But aside from the influence of a different costume design, what stands out about the costume is that it’s missing something that those of us who have paid attention to things like leaked set photos would notice. In those photos, (spoiler warning) there appears to be a S.H.I.E.L.D. patch on the costume, signifying that the web-head is working with the organization, which is presumably a major player on the world stage once again after the events of Avengers: Annihilation. Nick Fury and Maria Hill are also in the film, so it seems pretty obvious that they’ll be working to restore the intelligence organization to its former glory while having Spider-Man along for the ride. How will that happen? We’ll just have to wait and see, and judging by Sony’s willingness to censor a minor element in a character’s costume, we might have to wait until the release of Avengers: Annihilation or later to get a clear answer. This little change in the design is encouraging, as it suggests that Sony won’t be all gung-ho with spoiling the movie like they were with the ad campaign for Spider-Man: Homecoming.